I never expected to see the nose of a GE Dash-9 done well in LEGO. The double down slope is one of the most difficult shapes to achieve. By making clever use of a triangular flag Scott Wardlaw has finally pulled it off in this lovely eight-wide version of the locomotive. Seeing solutions like this is one big reason I love LEGO trains. 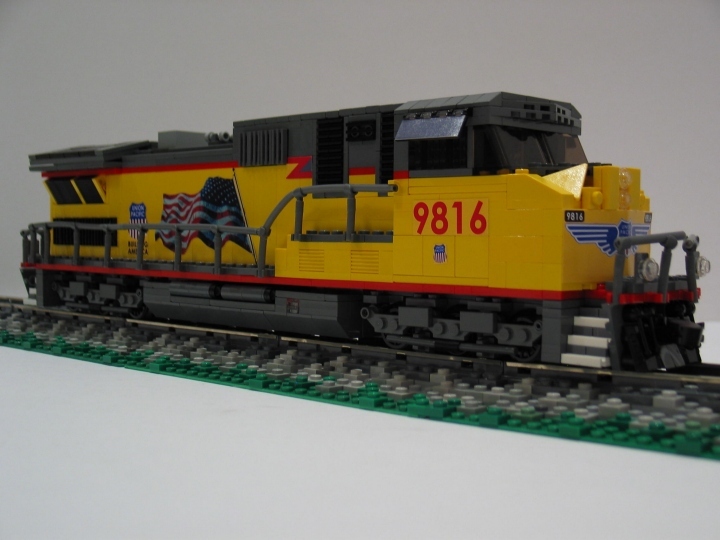 I’m more of a LEGO robot guy myself, but this sure makes me want to start trying my hand at trains. Good stuff. The triangular flag solution is indeed very nice. I can’t get over the fact of how wide the long hood is though. Building a six-wide hood on an eight-wide locomotive completely defeats the purpose of scaling up the train to eight wide for better proportions.